The Sociology of News reviews and synthesizes not only what is happening to journalism but also what is happening to the scholarly understanding of journalism. In the Second Edition, each chapter of the book has been updated to account for the radical changes that have reshaped the news industry over the last decade. 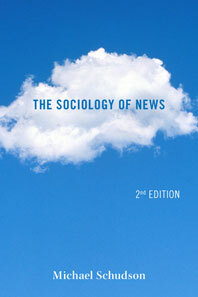 With a new chapter on the sharp contraction of the news business in the United States since 2007, The Sociology of News examines journalism as a social institution and analyzes the variety of forces and factors—economic, technological, political, cultural, organizational—that shape the news media today. Schudson synthesizes research from sociology, political science, economics, journalism studies, and communications in this brief, authoritative introduction to the news media’s role in society. The Sociology of News makes a seminal contribution to the sociological understanding of the role that news institutions play in the formation of modern public consciousness. When the First Edition of The Sociology of News was published in 2003, Craigslist, Facebook, Google, online-only news organizations, and TV shows like The Daily Show either did not exist or were in their earliest stages. In the new edition of his book, Michael Schudson accounts for the transformative impact these things have had on the news industry. He also includes a new chapter, “News Revolutions, Digital and Global,” which explores the sharp contraction of the news business since 2007. Chapter Two: Does News Matter?